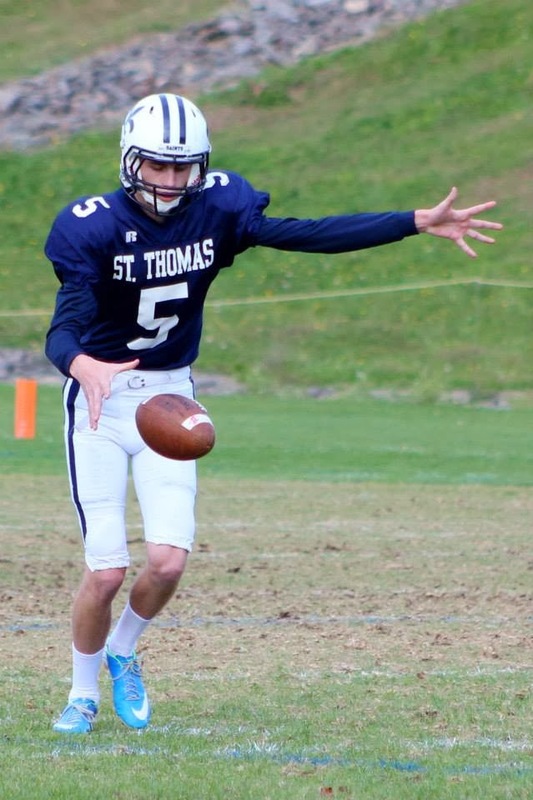 You can't underestimate the value of a good kicking game, and there is hands down no better kicker in New Hampshire than senior Hayden Middleton from St. Thomas. Middleton has been not only one of the best kickers but also one of the best players in the state since his sophomore year when he kicked a whopping 19 field goals which is one of the best single seasons for a kicker in state history. This year his longest field goal was from 50 yards and he also drop-kicked kicked an extra point against Trinity. In practice he has kicked a 55 yard field goal and his longest punt in a game is 80 yards. Middleton is a can't-miss D-I college prospect. "It's definitely apparent that other positions are recruited first, which has been challenging in the recruitment process" Middleton told the NH Notebook. "I have been lucky enough to have looks from a wide variety of schools from FBS - D3 schools. I feel that I have been more recruited initially for kicking but I think the fact that my punting and kickoffs have improved greatly this season makes me a more viable candidate to be able to offer that versatility to a school. It is a little frustrating because you feel like you are in a bit of a waiting game, but I am sure that there is a good fit for me and I am positive that I can be a successful kicker/punter at the next level." With his senior season now over (St. Thomas got robbed out of a playoff berth), Middleton now turns his attention to choosing the right college for him. UConn, UNH, Holy Cross, Albany and Duke are just some of the many schools who have contacted him. "He has been huge for this program over the last 4 years, kicking in big games and being Mr. Reliable" said St. Thomas head football coach Eric Cumba, who played his college football for UNH. "Hayden allowed us win the field position battle week in and week out with his kickoffs and punts. He was also able to help us get points when offensive drives stalled, hitting kicks from 40 plus consistently. His long this year was a 50 yarder. The beauty of Hayden’s ability is that he still has a lot to learn and made great strides from year to year. He worked hard in the off-season to become a better punter and that showed this year. I believe he is top 15 all time nationally in career FGs made but I could be mistaken. I have been around some pretty good kickers in my time. He is as good as any of them for sure. Hayden is the only one I’ve ever coached though." Oddly enough, Middleton didn't even start playing football until high school. "I grew up in England where I developed a passion for soccer and would play with the bigger boys every day" said the 6-foot-4, 170 lbs. Middleton. "I kicked the ball against our brick house probably a thousand times a day, every day. After moving back to the states when I was about 9, I wanted to try other sports, which further strengthened my leg. My parents always encouraged me to play different sports throughout the year to make me a well rounded athlete; I think that playing hockey, lacrosse, rugby, baseball and of course soccer has kept me fit and strong and has given me a lot of versatility. Rugby in particular has helped me with accuracy and punting distance. I continued to play soccer until about the 8th grade and wanted to try 'American' football. I tried out my freshman year and was thinking quarterback; Coach Wotton asked if anyone could kick and I gave it a go. I didn't get to be the quarterback. It was between his freshman and sophomore years at St. Thomas when Middleton really took his kicking game to the next level. "After that year of kicking, I realized that if I wanted to hone the natural strength and skill that I had, I needed to learn technique and timing and I had to focus on kickoffs and punting as well" Middleton explained. "I went to a couple camps. The Ray Guy Pro-kicker camp introduced me to proper form and gave me some fundamentals. I have continued with that camp each year since. I also went to a kicking day at UNH where I met Steve Wolf. Coach Wolf helped me take those fundamentals and personalize them. He helped me identify personal goals and gave me the tools to accomplish them like developing from a pretty good kicker to a kicker/punter. I think that working with Coach Wolf has definitely expanded my skill base. I have attended multiple show case camps: New England Elite, Kohl's, Pro-Kicker and have been invited to many college kicking camps. I am in the top 100 nationally and top 5 in New England." He has put in the work, and he has seen it translate into success on the field. That success will undoubetly continue when Middleton goes on to play in college. "I am excited to see where the recruiting process takes Hayden over the next few months" said Coach Cumba. "Wherever he ends up, he is going to be one of the fortunate few to get a college education and play college football. It doesn't get much better than that." Congrats to Middleton on a tremendous high school career, and best of luck with his college decision.